An incredibly brave and highly skilled Texas traffic cop saved multiple lives Sunday night when he killed two heavily armed men bent on storming a building where Pam Geller’s “Draw the Prophet Muhammad” contest was taking place. The unidentified police officer encountered the two suspects, believed to have driven some 1,100 miles from Phoenix to commit mass murder at the contest at a suburban Dallas venue. The two fatally wounded ISIS-supporting terrorists shot assault rifles outside the building and wounded a security guard and bullets struck a police car. The ISIS supporters wore body armor and were very heavily armed. 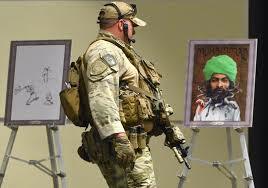 Local police, a SWAT team, FBI and ATF agents were on hand for the event, attended by approximately 75 people, which authorities anticipated could bring out Muslim extremists. The extremists sent out at least two tweets prior to the shootings, linked to radical Islam social media accounts, and they indicated that the attack was imminent. 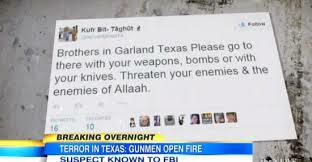 One tweet, which was sent at 6:35 p.m., only 15 minutes before the attack, used the hashtag #texasattack. “May Allah accept us as mujahideen.” Fortunately, these two terrorists were sent to the great Allah in the sky and their plans for mass murder were thwarted. My advice to all is that if you are ever pulled over by a Texas traffic cop, keep your hands where he can see them and do exactly what you are told. This particular Texas traffic cop, armed with only a pistol, took down two ISIS terrorists, protected by body armor and carrying assault weapons. Don’t mess with Texas. On April 28, 2015, I shared the contents of a letter that was written to me by an unidentified Texas Ranger, who warned me to not view the Walmart closings a pre-emptive move to establish FEMA camp processing centers. The Ranger warned me that his organization was bracing for a series of ISIS incursions and attacks on Texas soil. We have just witnessed the first ISIS attack and it certainly will not be the last, nor will it be the most violent. In the Garland attack, the ISIS perpetrators were thwarted, but will America be so lucky the next time? In less than two years, ISIS has gone from a terror start-up organization, supplied with abandoned American military equipment and funded by the CIA to what FBI Director, James Comey, calls a “chaotic spider web” inside of the United States who have a presence and are radicalizing Americans in 49 other states. Comey stated that ISIS uses social media like a job fair in order to recruit members and Comey suggests that this is how ISIS recruited three New York men which are now facing terrorist charges related to their ISIS activities. Didn’t Comey get the joke? He is not supposed to do his job. He was not put into the Director’s chair to stop ISIS from coming into America. He, like DHS, is supposed to play dumb and ignore the ISIS invasion of our southern border. It may not be long until the FBI has a new director. It is most certain that there is one so-called “American” who is not celebrating the avoidance of the potential massive loss of life in Garland, TX. and that would be the undeserving resident at 1600 Pennsylvania Avenue. His middle name is certainly not “Jesus” as he has banned the use of the Bible and blessings from Jesus by military chaplains. He has instructed DHS to identify Bible-believing Christians as domestic terrorists and he supports Muslim extremism as evidenced by his soft Iranian policy which will someday allow Iran to acquire nuclear weapons, if they have not already. Why isn’t this hero of the Garland Police Department being invited to the White House to receive a medal from the President for stopping these two ISIS terrorists? Why isn’t Obama singing the praises of this officer’s heroic act? Isn’t the answer to these questions obvious? It is because Obama is playing for the other side as he denigrates, marginalizes and persecutes the founding religion of this country while honoring and protecting the invasive one. Obama’s administration is a reflection of this philosophy. “ISIS has claimed responsibility for the attack outside a Prophet Mohammed cartoon contest in Texas — and warned of more attacks to come. 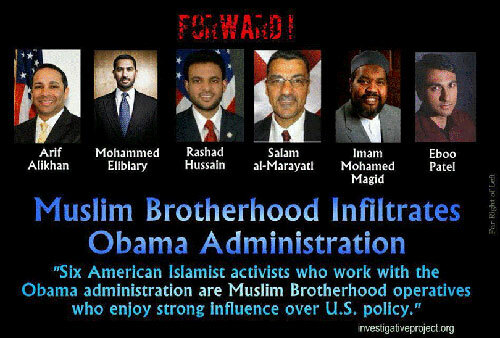 In light of the White House’s blackout on communications regarding the event in Garland, should we not continue to question the motives behind Jade Helm since Barak Hussein Obama is ultimately in charge? While we are at it, why do the riots in Ferguson (twice), New York City and now Baltimore all look the same? If one wants to stop the mayhem, they should be looking for groups like ACORN, The Southern Poverty Law Center, the race-baiters like Holder-friendly Al Sharpton and the CIA funded ISIS at these events? These race riots are clearly being orchestrated. 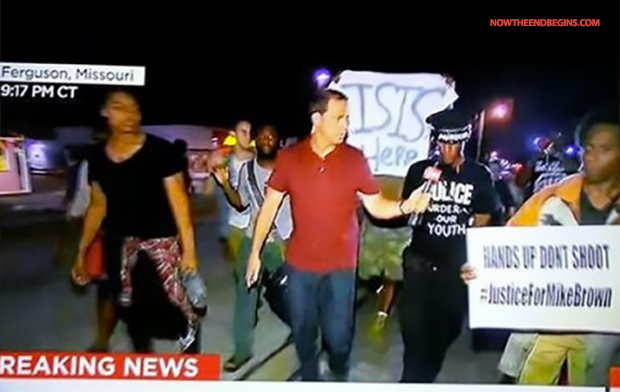 ISIS made their presence known in Ferguson. What did Eric Holder know that we are just figuring out? I have shown this photo before, it is time to show this photo again. 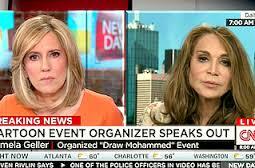 ISIS is here and can there be any question as to the intent of these events? These attacks which will emanate from our southern border will no doubt intensify as we move into summer. The artificially agitated race riots will increase through the summer and there is a link between the two events. ISIS will continue to be involved in future race riots. This administration will continue to leave our southern border defenseless for more ISIS attacks upon Texas, of an ever-escalating nature. Finally, Jade Helm, or its successor, will be required to bring martial law order to the United States. And sitting in the middle of it all are the lackeys working for this administration who are deliberately agitating the entire scenario through the anarchist practices of Cloward and Piven who have guided this President since day one. People often ask me how Jade Helm could go live? This is my answer.